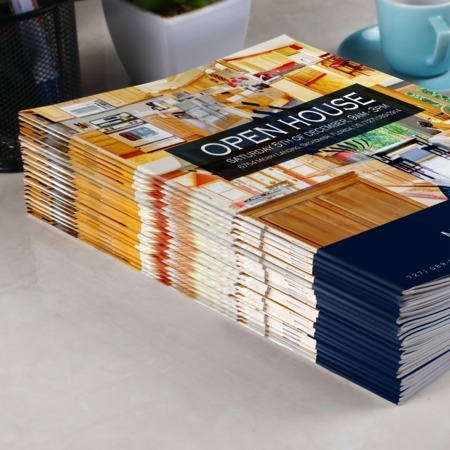 Bulk Booklets are a creative and professional way of presenting your product and services. These are also used to promote offers, provide list of services, or give information about your company. Moreover, these are ideal for CD and DVD cover booklets on launches. Each page of your booklet can help you gain more customers. Here at UPrinting, our booklet printing service can produce 250-25,000 copies. It is available in either custom or standard sizes. We assure you that our wide range of sizes will match your preferred design and layout. Just use the product calculator to change your preferred paper type, cover paper, pages, and binding options. Turnaround time is 4 or 6 days depending on your choice. Create your design and leave the professional online printing on us! Call us at 1-888-888-4211. If you have queries and questions, you can chat with us through our Live Chat. We are more than willing to assist you! Saddle-stitched binding is among the easiest and most common methods of binding. It is a soft type of binding which uses staples on the seam or spine.